Leonard Herbert Blades passed away peacefully, on May 12, 2018 at Red Deer Regional Hospital Centre, at 89 years of age. Leonard was born on September 8, 1928, in Red Deer. He attended school in Red Deer. After school, he worked with his father and brother in J. H. Blades and Sons trucking company. Later, he went together with his brother, Donald, and they formed the Blades Bros. Construction Company. Leonard married Dorothy Brannen, of Blackfalds, on April 7, 1954, and together the couple raised two sons. Blades Bros. Construction worked on various road construction projects in the City of Red Deer, including the 60th Street Hill, 40th Avenue Hill, Red Deer College, and Groat Road in Edmonton. As well, they completed the site work for Bowden refinery and the Peace River Correctional Centre. Leonard also worked for the City of Red Deer pushing garbage at various landfill sites around the city, using his Cat and hauling snow with his gravel truck. After Leonard and Donald sold Blades Bros. Construction, he worked with Boomer Bros, of Red Deer, on a job at Dease Lake in Northern British Columbia for two years, building a railroad right-of-way. After retiring from road construction, Leonard tried his hand as a realtor with Melton Real Estate. During these years, he also worked with Pete Shaw, and spent many winter hours maintaining and driving buses for the Red Deer Athletic Association (now Red Deer Minor Hockey) and periodically for the Red Deer Rustlers. Leonard then had the bug for operating heavy equipment again, so he rejoined Boomer Bros. Construction to work at the Joffre Petrochemical Plant until he retired. Leonard had a passion for sports and gardening. 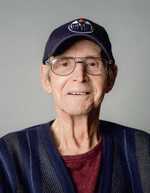 He was not only an avid fan of the Edmonton Eskimos, Edmonton Oilers, and the New York Yankees, but he also cheered on the local Red Deer Rustlers. He would always listen to the Red Deer Rebels’ games on the radio, but most importantly, he spent many hours watching his sons and grandsons play hockey. Leonard loved to work in the yard and garden. Leonard’s sweet peas were by far the most beautiful and lush of all to be found, growing to heights well above six feet, that highlighted his immaculately kept yard. When Leonard wasn’t taking care of the yard or watching sports, he could be found helping family, out for his regular visits with the coffee crew, or riding his bike on the Waskasoo Trails in the summer. He will be lovingly remembered by his two sons, Jim (Chris) Blades and Bill (Katharyn) Blades, grandsons Brett and Ryan Blades, sister Donnabelle Anderson of Saint George, Utah, as well as many nieces, nephews and close friends. Leonard was predeceased by his parents, James and Johannah Blades, brother, Donald Blades, sisters, Leona Blades, Phyllis Turner, Emily McLean and Dorlene Swainson. The Blades family would like to extend their heartfelt gratitude for the excellent care and warm compassion provided by Dr. Kruger, and the team of nurses in Emergency and on Unit 32, of Red Deer Regional Hospital Centre. We would also like to express our sincere thanks to Community Care Cottages - Maple Cottage and the West Park Lodge for the excellent care he received over the last several months. A memorial service will be held at Parkland Funeral Home on Tuesday, May 22, 2018 at 11:00 a.m. In lieu of flowers, memorial donations may be made to the Lending Cupboard Society of Alberta, 5406C - 43 Street, Red Deer, Alberta, T4N 1C9. To send flowers to the family of Leonard Herbert Blades, please visit our Heartfelt Sympathies Store.